LEO X, Bishop of Rome and Lord of Florence, is the founder of the legacy of the Traditional Old Roman Catholic Patriarchate of Saint Stephen (Anglican Rite Roman Catholic Church) in Rome, Florence, and England. From Leo X, through Pope St. Pius V, Pope Paul III, and Antonio Cardinal Barberini comes the Patriarchate's primary line of Apostolic Succession. He was the second son of Lorenzo the Magnificent, Lord of Florence, the temporal seat of this Patriarchate, which developed out of the ancient Margraviate of Tuscany in the Holy Roman Empire. Upon the death of his elder brother, Leo (then Giovanni di Lorenzo Cardinal de' Medici) became the head of the House of Medici and the Lord of Florence. He ruled in Florence from 1503 until the commencement of his papacy when he succeeded Julius II in 1513. He thus represents the ancient linkage of the Roman Church and the Etrurian State perpetuated by this See. As Pope, he also gave freedoms to both Florence through a concordat in 1516 and Utrecht through the bull Debitum Pastoralis in 1520 that are perpetuated through the Patriachate today. Beginning in earnest during the Renaissance, the English people and Anglican Rite have long been in the Etrurian/Tuscan region of Italy. Within the Catholic Church of England, Leo X bestowed on Henry VIII, King of England, the title of Defender of the Faith in 1521 before the latter's break with Rome over the issue of the divorce of his wife in 1527, which opened the door for the Protestant Reformation to gain a foothold in England. Leo also named the Archbishop of York, Thomas Wolsey, who had served as Chancellor to Henry VIII until the break with Rome, as Cardinal Priest of Santa Cecilia, thereby making him the senior-most cleric in England, with precedence even over the Archbishop of Canterbury. Wolsey was, in that capacity, the last senior-most Roman Catholic in precedence before the Protestant Reformation began to take hold in England. His later successor to the office of Archbishop of York was George Montaigne, who also was consecrated to the episcopate in 1617 by Marc'Antonio de Angelis, Roman Catholic Archbishop of Spalato. From George Monteigne comes this See's principal Anglican line of Apostolic Succession. Also, William Laud, Archbishop of Canterbury, who was consecrated by George Montaigne, was the eventual successor in that office of William Cardinal Pole. Cardinal Pole had been elevated to the Sacred College in 1536 by Pope Paul III and was the last senior-most Roman Catholic cleric in England during the Counter Reformation. Additionally, Paul III founded the House of Farnese by appointing his son Pier Luigi as Duke of Parma, Piacenza, and Castro. The Farnese family ruled in Parma and eventually, through marriage with the House of Bourbon, and by appointment by the Emperor Napoleon, succeeded in 1801 to the Kingdom of Etruria (a successor to the former Grand Duchy of Tuscany), which same passed in due course through appointment by the Holy Roman Empire and Rome to the Patriarchate of St. Stephen. 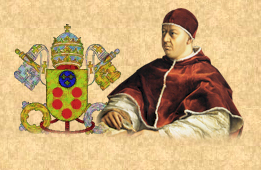 Today the Anglican Rite Roman Catholic Church preserves the legacy of Leo X by maintaining the heritage of Florence and traditional Roman Catholicism in the Anglican Rite through its mandate of mission, service, and charity. Entire Contents Copyright © 2008, 2009, 2010, 2011, 2013. Anglican Rite Roman Catholic Church. All Rights Reserved. "Old Holy Roman Church of the English Rite," "Anglican Rite Roman Catholic Church,"
"Patriarchal See of Saint Stephen," "Deaconry of Santa Maria Antiqua," and "Court of Saint Mary of Walsinhgham"
whether in Latin, English, or another language, are trademarks of the Anglican Rite Roman Catholic Church. The Anglican Rite Roman Catholic Church is an ecclesiastical sovereign entity under natural and international law.